Looking forward to celebrating Messy Jessy Gets Active today with the community at our local library. It will be the first time I’ve met the illustrator, Diane Lucas. We did all of our correspondence for the book on-line or over the phone. I can’t wait to thank her in person for doing such a wonderful job capturing Messy Jessy’s character! 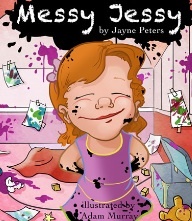 Diane Lucas has taken on the task of creating Messy Jessy in Messy Jessy Gets Active. Jessy’s joyous and creative personality shines through, even in the initial sketches. This is one of my favorite sketches. I can’t wait to see it in color! I’m sure my time in the rink, watching hockey games, isn’t causing any bias. I love that Jessy uses her imagination and creates her own fun throughout the whole book. She still has her bike helmet on from her adventures on the previous page. This sketch will make a great coloring page. .
You can learn more about Diane Lucas by visiting her website at http://www.lucasillustration.com/index.html.